WESTERVILLE — Two veteran officers shot and killed while responding to a 911 hang-up were true heroes because they spent their lives working for others and their community, a police chief told mourners Friday, Feb. 16. Hundreds of officers and deputies in blue and black uniforms from around the country crowded into a church for the officers’ funeral. Many watched the services on television in an overflow gymnasium next door. Officers Eric Joering, 39, and Anthony Morelli, 54, were fatally shot last Saturday (Feb. 10) after entering a townhome while responding to a domestic dispute. They returned fire, wounding 30-year-old Quentin Smith. Smith, who has been charged with aggravated murder, remains hospitalized and is expected to survive. He hasn’t had a hearing yet and it’s unclear if an attorney has been appointed. 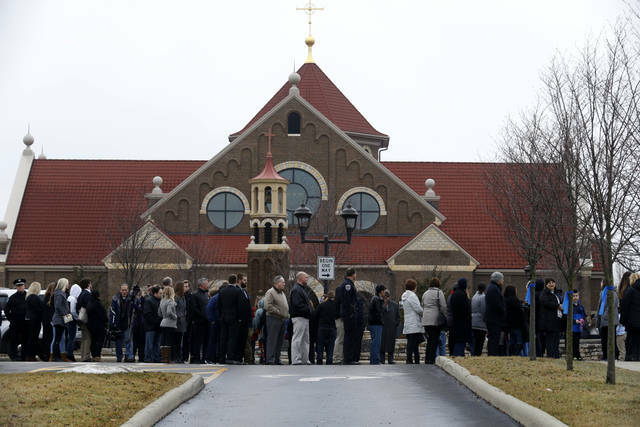 Before the services began Friday, mourners filed past a pair of flag-draped caskets inside St. Paul Catholic Church in Westerville, a suburb of Columbus. 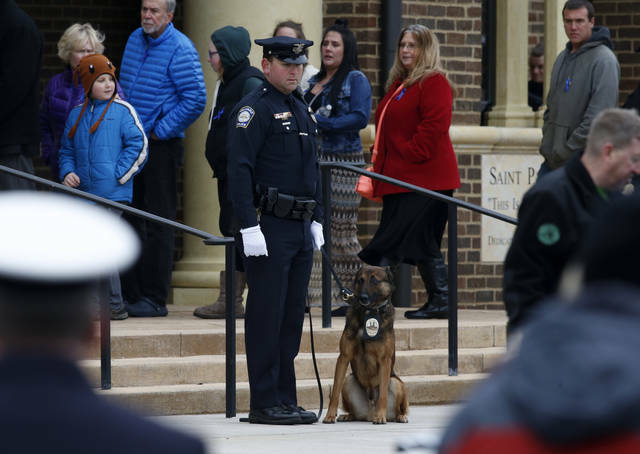 A uniformed officer walked Joering’s police dog in front of his casket. 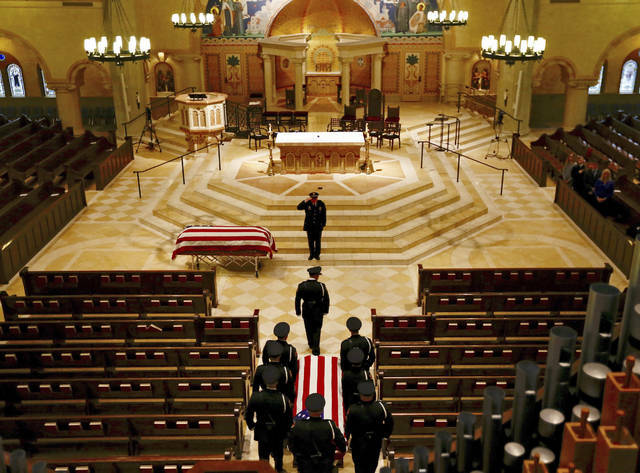 The officer saluted while the dog turned and sat facing the coffin for a moment. Republican Gov. John Kasich and his wife, Karen, attended the services, sitting near the altar with other state leaders. The Kasichs live in a nearby township. Westerville police chief Joe Morbitzer said both officers were heroes long before last weekend. Both men were married with children. Joering, a 16-year police veteran, had three young daughters. His pastor, the Rev. Kyle Hammond of Adventure Church in Lewis Center, said Joering would do anything for his family, including allowing his girls to style his hair and paint his nails. “I heard he drew the line at makeup,” Hammond said. Morelli was a 30-year veteran with two children, including a daughter who is planning a wedding this summer. Westerville police chaplain James Meacham said Morelli was always smiling and remembered how much he enjoyed life. “He went to heaven and partied,” Meacham said. After the services, a procession of police vehicles stretching for several miles slowly made their way through the city’s streets lined with people waving American flags and wearing blue ribbons in support of the officers. One of the hundreds who waited in the cold and rain to enter the church for the viewing was Zach Youmans, 24, of Westerville, a friend of Morelli’s son, Chris. “Whether you knew either of them or not, they still affected your life, whether you passed through Westerville or live here,” Youmans said. Patrol cars from Louisiana, Illinois, Texas, West Virginia, Michigan and many other states filled the church parking lot. Matthew Pfau, 27, an honor guard member with the University of Maryland-College Park police department, said the overwhelming show of support for police was the biggest he had seen.